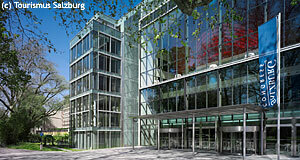 The Convention Center or Kongresszentrum of Salzburg is one of the biggest facilities of its kind in Austria and was opened in 2001 after many years of controversy about the projects – and at much higher costs than originally expected, causing one of the city′s main building scandals of the past decades. The original convention centre had been built after the war and was a 1950ies building that did not meet modern standards. Therefore, the city′s government decided in the early 1990ies to demolish it and replace it by a modern facility. In 1995, an international competition was held and a decision was made for a design by the two architects Friedrich Brandstätter and Ernst Maurer. The old convention centre was demolished in 1998 and the construction of the current building started, years after the idea was first dealt with by the municipal government. The Convention Centre (sometimes called Salzburg Congress) extends over five floors, blends in neatly into the historic surroundings despite of a friendly and modern design and has its own subway link. Too bad that Salzburg doesn′t have a subway (in the late 1990ies, some local politicians thought that the city would get one soon). Oh, and the ladies′ toilets have special lady urinals, because somebody thought this would decrease the time women spent there. It turned out that the opposite was true, because the strange devices caused much interest. The story caused quite a bit of amusement expressed through local media, but on contrast to what was stated here before, the urinals were never removed and are still being used. Thanks to the considerate reader among the administrative staff of the Convention Center for bringing this mistake to our attention. Otherwise, the interiors are modern, light and rather inviting. The Convention Centre offers enough space for a total of up to 2,500 people. The biggest single hall with a stage is the Europa Saal, which seats up to 1,350 people. There are facilities for all sorts of electronic devices, light effects, translation services, a press office and several sophisticated stages. On sunny days (about three a year in Salzburg – see our sad article on the weather), the Congress Center can cover its electricity consumption from its own photovoltaic cell system. Another good thing about the Salzburg Congress is its central location right next to Mirabell Palace. Salzburg, the city of Mozart, is one of the most popular event locations in Austria. Situated on the outskirts of the city, yet only a few minutes from the city centre, brandboxx is Salzburg's most extraordinary event venue.